When I was a kid, I spent countless days with my Brothers and Sister playing in a ravine down in the woods. Some of my favorite times as a kid were spent down there trying to catch snakes in a sock, or building dams to try to make a swimming pool (which never worked). I have this image in my head of the point where we would come down from the hill and enter the Ravine, and I tried to paint that image here. I started with a rough sketch but did not put a lot of detail in because I’m going off of a mental picture that I wanted to flesh out in paint. I should have sketched a little more in order to get the mass of the objects I wanted to paint. Because I didn’t think about the shapes being rounded, they ended up feeling fairly flat. I think I achieved some of the depth I was after by making the foreground very detailed, and the background more loose. I put down the first wash, to get the planes defined a bit, and then started painting details. I should have started with the back ground and layered the foreground over it, but for some reason I went in reverse. That wasn’t very successful and ended up making the planes feel very flat. I want to try again thinking about the mass of the large shapes before painting in the details. I also experimented some more with the white pigment, trying to use it to tint the other pigments instead of laying it on top at the end, I like the way it spreads and blooms when added wet in wet. I need to try to preserve more paper on the next version to keep the highlights more pristine. I also tried to darken the foreground to give the feeling of the cliff on the right shadowing the Ravine, I think that’s the right idea. The water in the foreground I’m pretty happy with. I painted the rocks first, and then reflections. Then I layered on some very wet in wet washes to attempt to get some dynamic blooms that I thought would represent water. That worked better than I thought, and I think next time I will do that before I paint the reflections. Then, I can try to use the defined reflection lines to play off of the blooms that come with the wet in wet technique. Because the blooms have a mind of their own, it would be better to put them down and define them, as opposed to trying to make the blooms obey the straight lines that I put down first. I also need to better define the shapes of the rocks so I can add dramatic shadows to the appropriate faces. 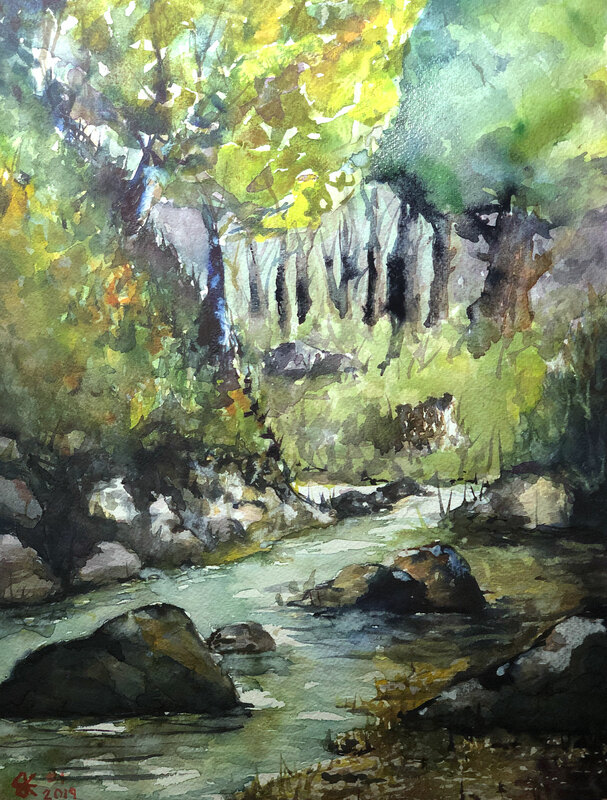 In this painting, I sketched the rocks and put the paint down somewhat haphazardly, thinking I’d see what the rocks did, and shadow what came about. That didn’t work as well as I wanted. Next time I need to reverse my process with the rocks and the water. The cliff face on the left needs more light definition as well, which I should try to achieve by laying down the first wash as my highlight color, and then add shadows. That’s a process I should know enough to follow by now, but I keep finding myself trying to paint shapes instead of shadows. For some reason it’s hard to get my mind into the mode of “just paint shadows.” But I think to some degree, this is what I need to do. In the end, this sort of captures the image in my mind, but it doesn’t do it justice. The area beyond the cliffs should feel more open, and the cliff walls should look more like shale, and less like boulders and grass. I will definitely try again.